Heat a couple of spoons of olive oil in a large frying pan. Add one chopped onion and a couple of cloves of minced garlic and sauté for a few minutes. Then, I add a basket of cherry tomatoes along with the okra (stems removed and left whole if tiny, sliced, crosswise, if large), a few leaves of basil and a hint of fresh oregano. I don’t cook it very long – just long enough to get the tomatoes to pop and the okra to soften slightly. Too long and you get a kinda slimy mix – still delicious, but not the greatest texture on the palate. 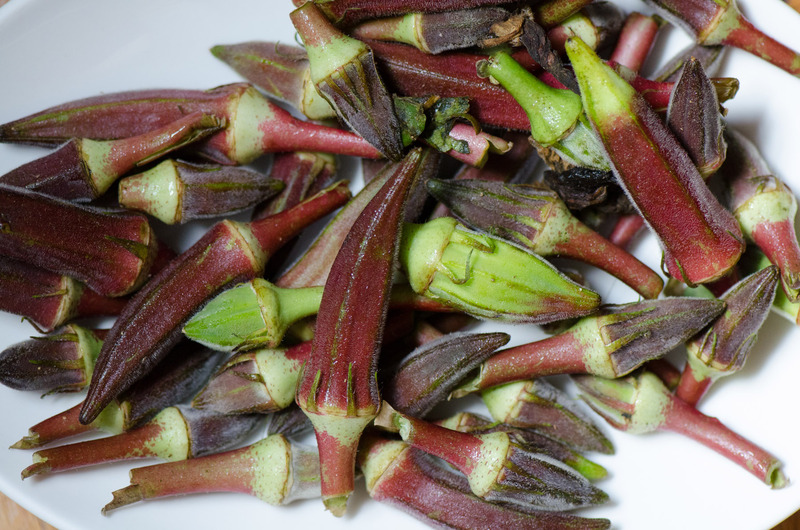 I have always loved okra; even as a kid, I’d eat the okra pieces out of Lipton’s Chicken Gumbo Soup before I’d dig into the bowl. Don’t ask me why, ‘cause I really have no idea why it holds such appeal. 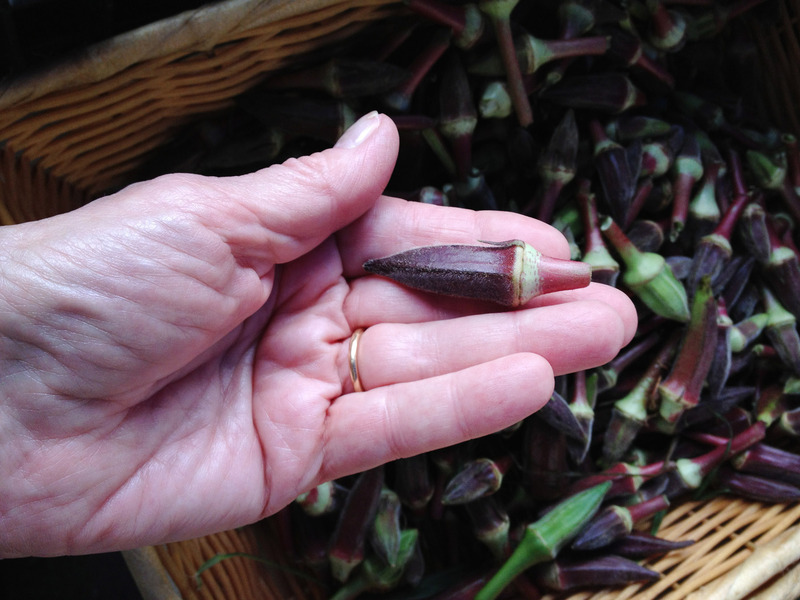 But, I only cook it in the summer when it is fresh in the farmers market or at farm stands and I only buy the wee pods as the big ones are tough and stringy. The recipe I use is quite simple and so yummy – or, at least it is to me. If this one doesn’t make you a convert, try it sautéed with lots of onion, a touch of tomato, and lots of Indian spices or curry powder and chiles – also delicious! 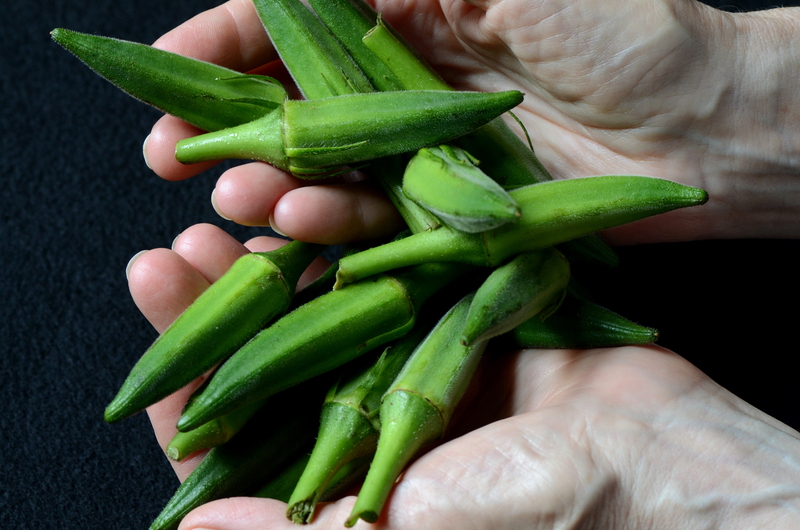 And, if you have the time, there is nothing better than pickled okra – it is a crunchy snack or hors d’oeuvre. Heat the olive oil in a large sauté pan over medium heat. Add the onion and garlic and cook, stirring occasionally, for about 4 minutes or until softened. Add the okra and cook for a minute or so. Stir in the tomatoes and season with red pepper flakes, salt, and pepper to taste. Cook, stirring frequently, for about 10 minutes or just until the okra is still a bit firm and the tomatoes have softened and exuded their juice. Stir in the parsley, remove from the heat, and serve.